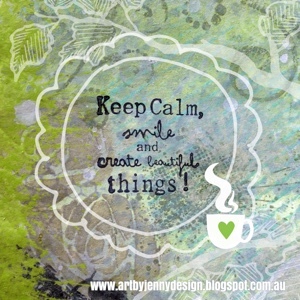 Keep calm, smile and create beautiful things... my favourite phrase stamp! This is part of an art journal page created during an afternoon with friends. We had coffee, lunch and lots of laughs. A totally fabulous day! Background was made using Tim Holtz Distress paints and inks with Darkroom Door and IndigoBlu stamps and Tim Holtz stencils. The new Twisted Citron lime green Distress Paint is on the left hand edge, stamped with the borders stamp from IndigoBlu. The roses are made from th "Scribbles" Layering Stencil by Tim in the same paint but inked over with Weathered Wood Distress Stain, using a sponge. Sponges are great for layering as they are soft and ink soaks right in, giving you light feathery marks. The final look was created on my phone using 'Studio' and a few of their groovy elements. All items used are available in my shop including the wonderful book this is in ... Dylusions Art Journal (small). Sing out if you'd like further instructions on how to get this look.